Applepalooza. 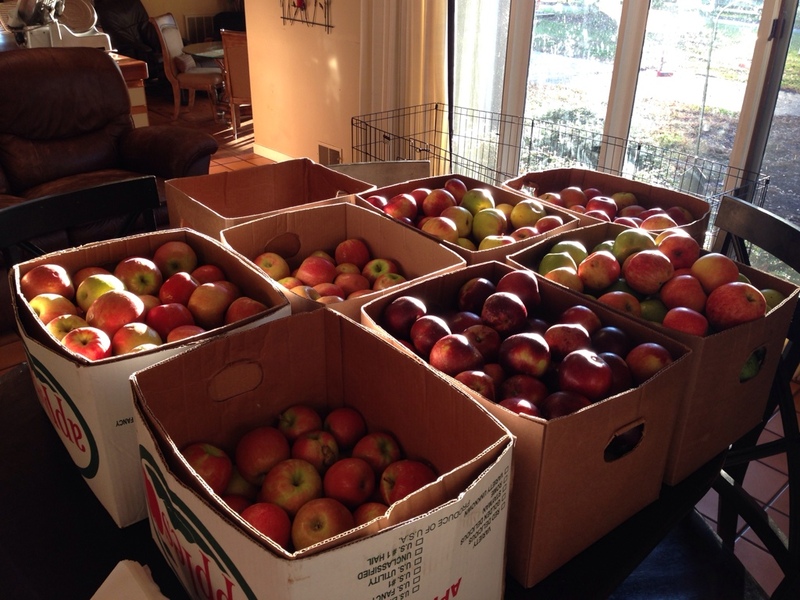 7 1/2 bushels of apples turned into various products. This weekend we finished the season with one of our farm vendors who was down to the last of his apples. A few negotiations back and forth and we agreed I would take the last of his stock, 7 1/2 bushels of apples, all varieties. So what in the world do you do with 7 1/2 bushels? Why you open a bottle of wine and fire up the grill. Then you invite all of your friends and neighbors over and you have an apple peeling party complete with authentic ninja pig on the grill cooked by jet setting grill superstar Bar-B-Jew. Panoramic shot of the kitchen in full on apple mode. Here you can see the kitchen in full production. Wine glasses, apple peels, the football game on, the grill going just outside, and everybody working till bed time. The results of about 3-4 hours of work. 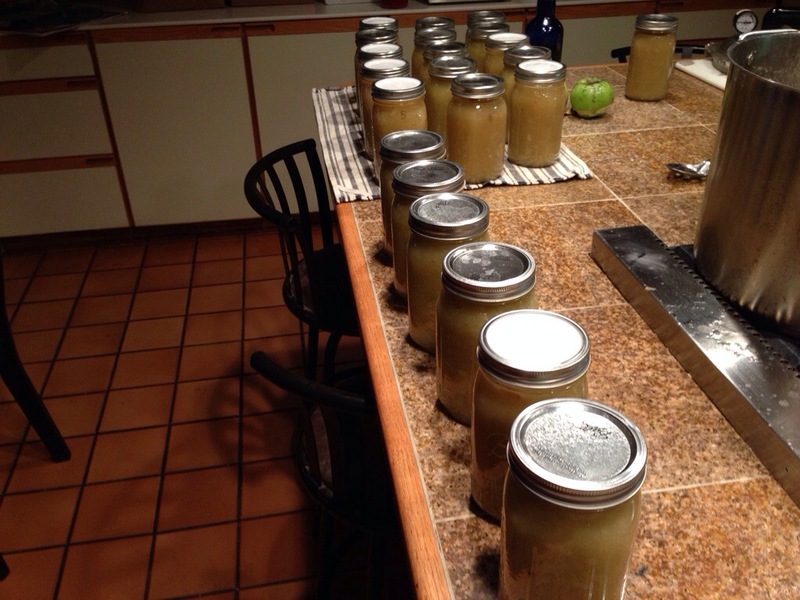 21 quarts of apple sauce, plus another 14 gallons of wine in the fermenter. That left us with ONLY 3 bushels of apples (minus the bushel we made the Goldbergs take). Today SWMBO worked diligently between school and laundry and got another bushel ready for apple sauce plus reduced another 6 quarts of apple sauce so it would be ready for me to can tonight. She has been a trooper with all these apples. Btw, apples and grilled pork are a perfect match. 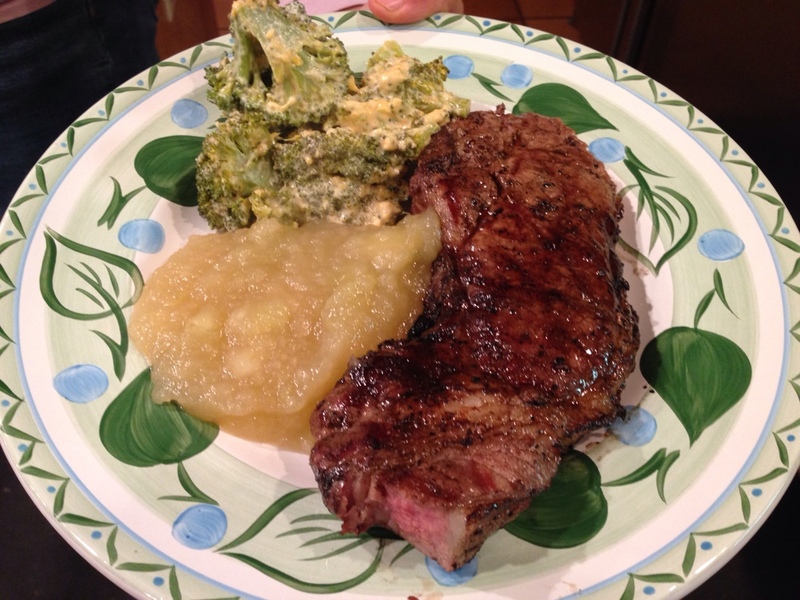 Pasture raised, non GMO pork chops, home made apple sauce, and broccoli.